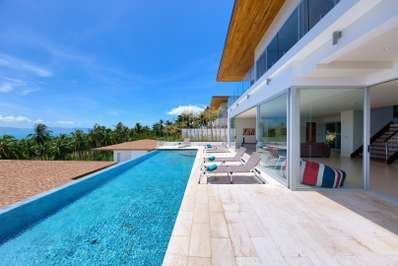 Eats & Retreats features a curated portfolio of Bang Por private luxury villas & vacation rentals to rent for individuals, couples, friends, families & large group holidays. We work directly with property owners to guarantee the best price. We also provide a book-now service with a 72 hour free cancellation period. 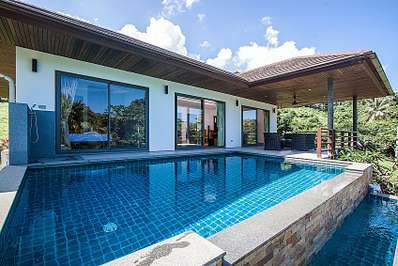 Bang Por is a quieter area of Koh Samui while still close to luxury amenities, making it a sought after location for those seeking something a little more tranquil. David Beckham has recently made headlines by purchasing a substantial high level area of land at one end of the beach, while at the other end, explore a little further and you'll come across the new Four Seasons Resort, Koh Samui. So what is it about Bang Por that attracts the high profile investors and companies? The beautiful white sandy beach with good swimming waters is very picturesque with stunning views over to Koh Phangnan. Thanks to the refreshing breezes over the Gulf of Siam, the location is also ideal for all year round sailing. The location offers a number of very good Thai restaurants where you can dine in a beautiful setting. Fresh seafood arrives daily. It's the health lover's dream. There are also a few spas offering a range of treatments including whole detox programs, yoga sessions as well as first-class massage. From Bang Por you can drive easily into the hills and enjoy some of the most spectacular views on the island. Bang Por beach offers the perfect setting for those seeking a more sedate holiday away from the hustle and bustle but at the same time retaining its tropical magic. The holiday villas & apartments offer both beach front and hill side locations, for everyone's preference. It seems that every development here is well considered, paying careful attention to the environment and the attractions around. Spend some time to look through the villas of Bang Por and keep the charming location in mind for a special out of the way holiday. Bang Por villas are easily reached via the main road, 20 minutes from the international airport and 10 minutes from port town, Nathon.